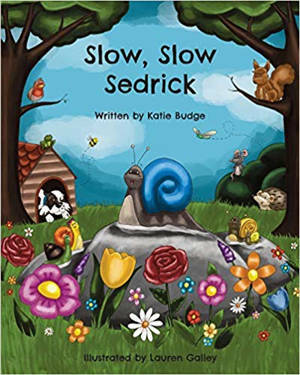 I’m reviewing a lovely children’s book today – Slow, Slow Sedrick by Katie Budge. My thanks to Claire Cumberland from Blue Falcon Publishing for sending me a copy for review. as slow as a tortoise moving through snow! Poor Sedrick is the slowest creature in the garden. His friends try to help him move faster, but all of their plans go horribly wrong! Sedrick is miserable, until he meets someone who shows him that taking your time can be a good thing. There is something for all ages in this light-hearted tale which teaches children that it’s okay to be yourself – in fact, it’s a whole lot of fun! This charming story is the second children’s book from Stevenage-based Katie Budge. She aspires to write stories that children can fall in love with, while learning morals and values that will stay with them for a lifetime. Oh, I love this book and I love Sedrick! Snails are not known for being fast and Sedrick was starting to feel like he was being left behind. His friends were all much quicker and mostly they understood that being slow was just Sedrick’s way, but sometimes they got a bit impatient with him too. There’s some real humour in this book and I found myself smiling and laughing at parts of it, in particular when Sedrick’s friends try to speed him up in various ways such as strapping him to a roller skate (no brakes!) or to a ball (dogs like balls!). As well as this though, there’s a moral message for children. Actually, there’s more than one. The first is to be who you are and be happy with that. If slow is your way then that’s how it is. Good friends will be your friends no matter what. The other message is to take life a bit slower (I think we’re all guilty of rushing around and not seeing what’s around us anymore) and just enjoy your surroundings and allow yourself to take it all in. I have to say that I do love a children’s book that rhymes and Slow, Slow Sedrick does just that. It seems to really help the flow of the book. There are some lovely, bright illustrations by Lauren Galley to accompany the story which really helped to bring the story to life. All in all, this is a delightful read for kids (and adults, to be fair) and great for home and school. Katie Budge lives in her hometown, Stevenage, with her fiancé, two young sons and dog Thandi. She has been writing children’s fiction since she was 17 years old, and now has a portfolio of over 30 stories; she would love to have as many published as possible. Her first published work, Percy the Pigeon, was about a greedy bird who didn’t understand the importance of sharing and the value of friendship. Katie is inspired by the work of Rachel Bright; particularly the fact that there is an important lesson contained in each of her tales. This is an element Katie tries to incorporate into her own writing, and she hopes that children will fall in love with her stories while learning morals and values that will stay with them for a lifetime. Slow, Slow Sedrick will be Katie’s first book with Blue Falcon. It follows Sedrick the snail who can’t help but wish he could get around a little faster – until he meets someone who shows him the positive side of plodding along! We are thrilled to have Katie on board! You can hear more from Katie on Facebook at Katie Budge Books.